Dog Days of Summer to Benefit Cindy’s Pets in Pasco. The New Barker and Trinity Regional Rehab Center host Dog Days of Summer to help raise pet food for seniors on the Meals on Wheels program. 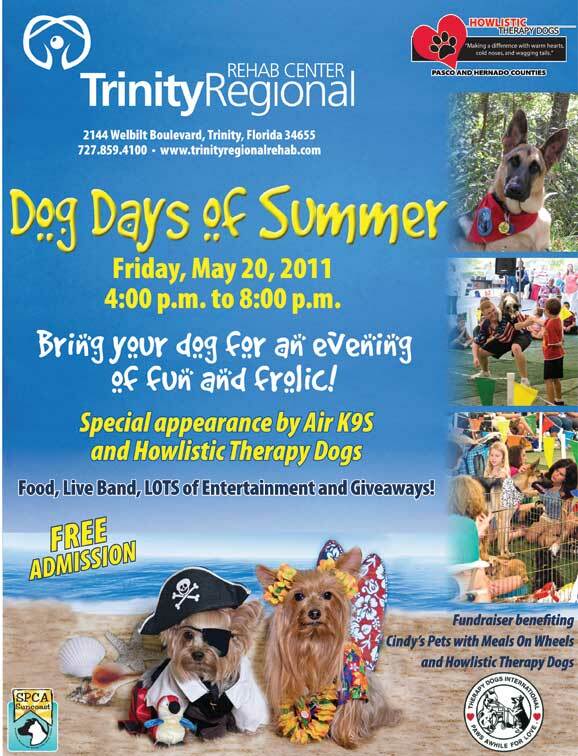 Trinity Regional Rehab in Trinity, Florida is hosting its Second Annual Dog Days of Summer on Friday, May 20 from 4:00p.m. until 8:00p.m. Last year, more than 400 people and their dogs attended, which helped raise $1600 for the SPCA Suncoast. This year the event will also benefit Cindy’s Pets with Pasco County, Florida’s Meals on Wheels. It had been noted that many Pasco County seniors, while participating in the Meals on Wheels program, were giving a portion of their delivered meals to their pets. In fact Meals on Wheels volunteers identified 155 pets owned by homebound seniors who would benefit from a pet food assistance program. The Genesis Prep School, along with interested parents and friends came together when they realized seniors were having difficulties feeding their pets. Cindy’s Pets was created in the memory of Cindy Allgood, a pet lover. In January, volunteer Meals on Wheels drivers began delivering donated pet food to 83 seniors for a total 149 pets: 90 cats, 52 dogs and seven birds. One of the seniors was so moved by the gesture, she called Meals on Wheels to thank them and offered to send money from her Social Security check. Genesis School East Campus, 8100 Mitchell Ranch Road, New Port Richey, FL. Genesis School West Campus, 6609 River Road, New Port Richey, FL. Those interested in becoming a vendor at the Dog Days of Summer should contact Annette Claire at 727.859.4100. Trinity Regional Rehab Center is located at 2144 Welbilt Boulevard, Trinity. You may also contact the media sponsor, THE NEW BARKER dog magazine at info@thenewbarker.com. The cost for a vendor space is $25, or you may donate a gift basket worth $25. For more information on Cindy’s Pets, visit http://www.cindyspets.org. Previous Previous post: Only in Florida: Baseball. Wonderland. And A WWE Smackdown. Next Next post: Deserving Dogs Win Cruise Aboard Nauti-Dog II.